It’s been something we’ve been quietly working on over the past few months, and it definitely explains the lack of blog posts over the last little while! It’s with the greatest excitement I can share a little collaboration we’ve had with BHLDN for their 2016 bridal hair accessories collection. But first, a little confession – I can still remember the exact day I learned that Anthropologie were launching their bridal store, BHLDN. It was St Valentine’s Day in 2011 and my head exploded with excitement when their website finally went live. I have loved Anthropologie for so many years and to think they were going to launch a bridal brand… oh my goodness! Their whimsical, romantic and beautifully styled pieces were everything my little heart could only dream of. I looked to their collections year after year admiring the beautiful selection of pieces that lay before me. All the delicate details, the vintage-inspired yet classically gorgeous combinations, and all with a inherently heirloom quality. Everything I’ve always appreciated and valued, and everything I’ve always strived towards in creating my own little brand since January 2009. It was such an honour to be asked to work with BHLDN on their 2016 collection where our Ethereal halo and Rosina bridal comb were released as part of their bridal hair accessories range. The Ethereal floral halo, available through BHLDN, is handcrafted from pearls, crystals and delicate clay floral details. We love the idea of styling the Ethereal as a headband. Of, to channel your inner boho spirit, wear it a little further forward across your forehead for a more bohemian feel. The Rosina bridal comb, available through BHLDN, was inspired by the wonders of the night sky. 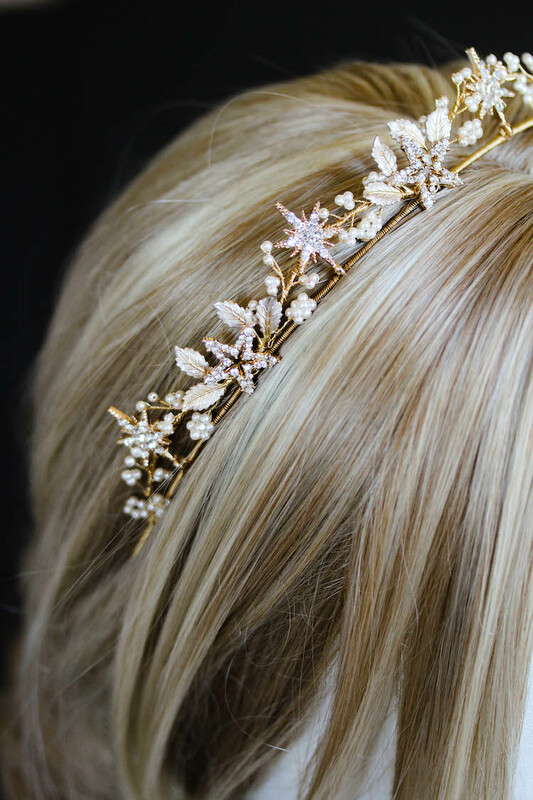 It features delicate Swarovski crystal branches and pearl accents, and we think it’s the perfect little piece to tuck into a romantic updo. And, we couldn’t help ourselves. Here’s some behind the scenes shots as we packed and got several hundred of them out the door! Go team! Be sure to pop over to their website to browse their beautiful collections. What a joy and a huge honour to be able to work with our favourite bridal brand. Long hours, sleepless nights and lots of sore hands and fingers, but something the team and I are super proud of.